In cities across the United States, sandwiched quietly between the newly coveted urban space of the central city and the suburban sprawl of the periphery, are outwardly conventional landscapes experiencing profound transformation. These landscapes are neither urban nor suburban, but a conglomeration of both, a hybrid condition mixed from one part global city, one part garden suburb, and one part disinvestment. The glue that holds these landscapes together is that most were developed at one time, for one market and for one purpose—with the monotony and uniformity that goes with this—yet have transformed into something else entirely. The Gulfton community in Houston is one of these landscapes, and the challenge of retrofitting this landscape to meet the needs of new residents was the focus of the project. The PARKED project explores the possibilities for retrofitting 1970s garden apartment landscapes through civic infrastructure in a way that supports the changing identity of the community and the transnational urbanism that has emerged. The project departs from the static field and limitations of the existing physical landscape, and seeks to generate an open, unbounded space that works in concert with the provisional and transnational cultural landscape that has surfaced where spaces are appropriated, transformed and occupied in new ways. Civic infrastructure (neglected in the original development) is the foundation of the project, woven through leftover spaces to become the framework to support the social and cultural identity of the area. 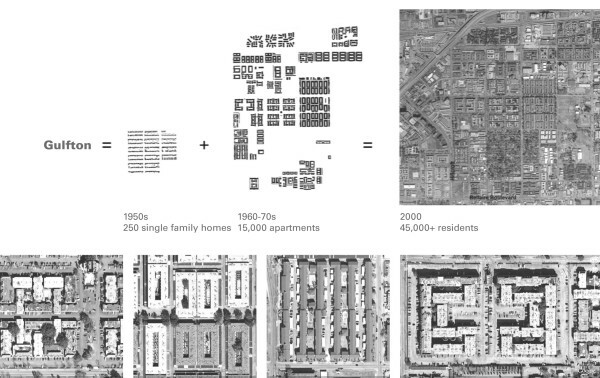 Additions and subtractions are a natural process in the transformation of cities over time. Cities evolve, communities change and shifting demographics alter the culture of places in ways that constantly work to make and re-make our built environment. Productive critique of the adaptability of space over time is a useful strategy in locating places, buildings and architecture within the changing landscape of our cities. But development is different—the values that drive large-scale development are not the same values that drive design. In development, public space and civic infrastructure are costly, superfluous, and calculated by ordinance instead of by needs. Development, and the ordinances that guide it, assume a static condition instead of the reality of fluidity, generating environments not easily adaptable to change. Interceding in this system means looking for opportunities for transformation that could potentially have a ripple effect and influence what we build in the first place. As a result, opportunities within the confines of the physically divided but socially rich landscape of Gulfton are found in leftover and under-utilized spaces. Already residents fill these spaces with temporary uses. The PARKED project looks to make more permanent adaptations by carving out spaces for public and civic infrastructure in a predominantly private landscape in order to accommodate both permanent programs and temporary events. The project also explores how the everyday city, and the transformations that have occurred from the bottom up can become catalysts for intervention. In other words, the projective field is the existing physical and cultural landscape, and the interventions seek to reinforce the social bonds by creating networks of spaces and programs. Prior to the 1950s the Gulfton area was a greenfield, entirely undeveloped. In the decades that followed Houston’s population would explode and rapid development would occur to accommodate that growth. In Gulfton, that would mean the construction of 15,000 apartments in 90 complexes. The apartments, built in the 1970s, accommodated the lifestyles and desires of young, predominantly white, professional singles, equipped with amenities such as hot tubs, swimming pools and club houses—and supported with neighboring discos and night clubs. When the bottom fell out of the oil market in the 1980s domestic migrants packed up, while at the same time war and poverty brought new migrants to the city from more distant places such as Mexico, El Salvador and Vietnam. This migration marks the beginning of Gulfton’s transformation from a swinging to a transnational suburb. Today, Gulfton is the nexus of Houston’s transnational communities. The local mall has lost all of its franchises and instead is fueled by independent stores, 1970s apartment complexes have been re-purposed as mixed-use with stores occupying the ground floor apartments, and tract homes now house beauty salons, tire repair and small tiendas. The mixed-uses in Gulfton grew spontaneously, from the bottom up. Demographic change has also transformed the community. Between 1980 and 2000 Gulfton’s population nearly doubled (the area today is the densest neighborhood in Houston), rising from 26,000 to over 45,000 without the construction of a single additional housing unit, and in fact with a net loss of 444 units. Swinging singles moved out and immigrant families moved in, more than doubling the occupancy in each unit. In 1980 only 15 percent of the population was comprised of children age 18 or younger, by the 2000 count, that number was closer to 30 percent. Over 60% of current residents were born outside the U.S. and represent more than 50 nationalities. The dramatic changes in the demographics of the population have occurred without a change in the housing stock, Gulfton’s forty-year old apartments are aging with minimal care and maintenance. A network of global infrastructures keep the residents connected to their countries of origin, culture, language, families, and friends. Telephones, cable television, the press, and wire transfers keep conversations, politics, and money flowing. Multilateral globalization (versus unilateral Americanization) is highly in evidence in the community and offers a glimpse of a future world. For example, ADOC footwear, with shops in Guatemala, El Salvador, Nicaragua, and Costa Rica has one store in the U.S., located in the center of Gulfton and Pollo Campero, a Guatemalan chicken franchise opened its second store in the U.S. in Gulfton. The community also has three U.S. branches of Salvadorian banks and a FAMSA furniture store, the Mexico-based self-professed “store without borders” where you can purchase a stove in Houston to be delivered to a family member anywhere in Mexico. In many ways the residents of Gulfton are more connected globally then locally. While networks keep people connected globally the physical landscape divides. Gulfton was built privately, for profit—without the civic infrastructure of recreation centers, libraries, public spaces, the connectivity of small blocks or other amenities. There are more than a hundred pools in Gulfton, many now filled in, but there is only one thirty acre park, each apartment complex is an enclave unto itself, you could comfortably fit sixteen standard downtown blocks in one superblock in Gulfton, sidewalks are infrequent, and with the exception of the park the only public space is the street. The social bonds that have developed in the community apply constant resistance to the physical division that characterizes the landscape. Furthermore, these social bonds have developed in a community that is highly transitional, more than 90% of Gulfton’s residents rent. Yet, social bonds cannot deconstruct material walls. Gulfton was developed as a primarily private pursuit, as a result public space is virtually non-existent. This fact does not limit residents from pushing against these constraints. From the community’s under-utilized parking lots to the informal commerce that activates them, from the abandoned car dealers to the enterprising shopkeepers that are housed there, from the evenly spaced day laborers occupying the median and vying for opportunity. The story of Gulfton is one of fluidity and stasis, of how social and cultural bonds can breathe life into dead spaces regardless of how mean or inhospitable those spaces are, and that physical form is enduring, and much harder to retrofit once constructed. A lesson that could potentially influence future large-scale developments, or more likely be ignored. The PARKED project departs from the idea that additions and subtractions are a natural process in the transformation of cities over time. Cities evolve, communities change and shifting demographics alter the culture of places in ways that constantly work to make and re-make our built environment. Productive critique of the adaptability of space over time is a useful strategy in locating places, buildings and architecture within the changing landscape of our cities. The Visit Houston website boasts that the city “rates first among the nation’s 10 most populous cities in total acreage of parkland and second behind only San Diego in park acreage per capita.”1 The city has 56,405 acres of total park space, with an average of 27.2 acres per 1,000 residents. In Gulfton, however there is one 30-acre park that serves over 45,000 people—or a meager 2/3rds of an acre per 1,000 residents, 2.5% of the average or 29 square feet per resident. 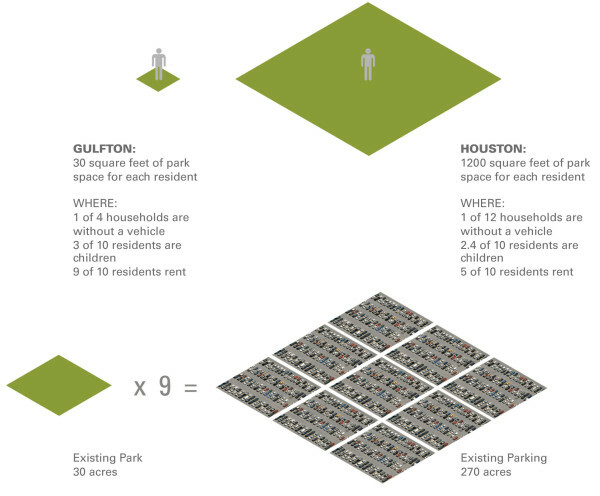 The disparity in park space in Gulfton could be ignored if the area was developed with single-family homes, each with a little piece of private park, or if nearly one out of two residents didn’t depend on public transportation or walking for mobility, or if 3 out of 10 residents weren’t children. The backyard is not an option, nobody has one, and traveling to other parks outside of the community is also a challenge. Thus, in this landscape the one park is a safety valve, a respite. To compound the problem the 90 apartment complexes with 15,000 apartments have approximately 40,000 parking spaces that occupy more than twelve million square feet of land, or 275 acres. Parking, in other words, occupies nine times the amount of land as the single, 30-acre park in the community. If just 25% (the number of residents without a vehicle) of this land was re-purposed it could free up to 68 acres for new uses, especially open spaces. The project began by diagramming both the existing parking lots and the potential to transform the land into public spaces and programs. 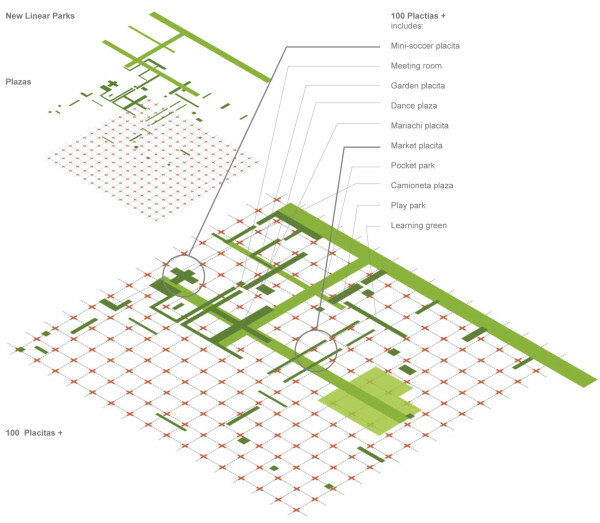 A sample of land uses in one apartment complex illustrates the predominant imbalance between private and public space. In this former “swinging singles” complex comprising 800,000 square feet of land: 59% of the land is occupied by parking; 33% by apartment buildings; and the remaining 8% open space—mainly ornamental, with no family amenities. The strategies for the PARKED project build on the projective field of the existing social and cultural landscape and an analysis of existing parking lots, see figure 6. The goals were to create small parks, placitas, and new paths that would interlace between and adjacent to the existing apartment complexes creating varied public places, with rich programs, that would connect throughout the community. A mini-soccer field, community gardens, dance floors, tot lots, learning and playing spaces, and gathering areas drove the programming for the carved out spaces. In the composite the strategies begin to break down the super-blocks dominant in the neighborhood, linking the complexes through green space and creating programmed spaces for play and relaxation. The physical network works to mimic and support the social networks that already exist in the community.